These rare, sickly-looking fellows are found only in a tiny, mountainous part of Chile. Adults spend most of their time scrambling around the forest floor, probably munching on insects. It sounds a lot like a Victorian consumptive travelling to Switzerland to enjoy the effects of the clean, alpine air. The fact that they happen to be very far away from any major population centres is a complete coincidence. Honest. 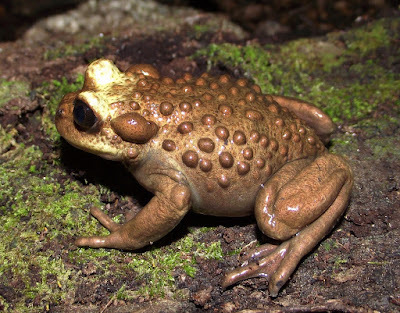 When the mating season comes along, warty males and warty females all gather at fast-flowing streams to do the kinds of things warts were never meant to do. Hopefully those streams flow as fast as a flushing toilet. The tadpoles grow up in those same streams and must cling to rocks with their weird sucker-mouths to prevent themselves getting swept away. The tadpoles are lovely and smooth at first but that doesn't last long. Alas. What function do warts even have for a toad, false or true? I had to look that up and I'm still not completely sure! They seem to be concentrations of glands, probably ones that secrete nasty-tasting stuff for defence. That's usually what the big ones behind the eyes are and I guess the smaller ones on the body and that, too. Why they're quite so voluminous, I don't know. Maybe they're just THAT full of glands?